Afghanistan receives far more aid than any other single country. 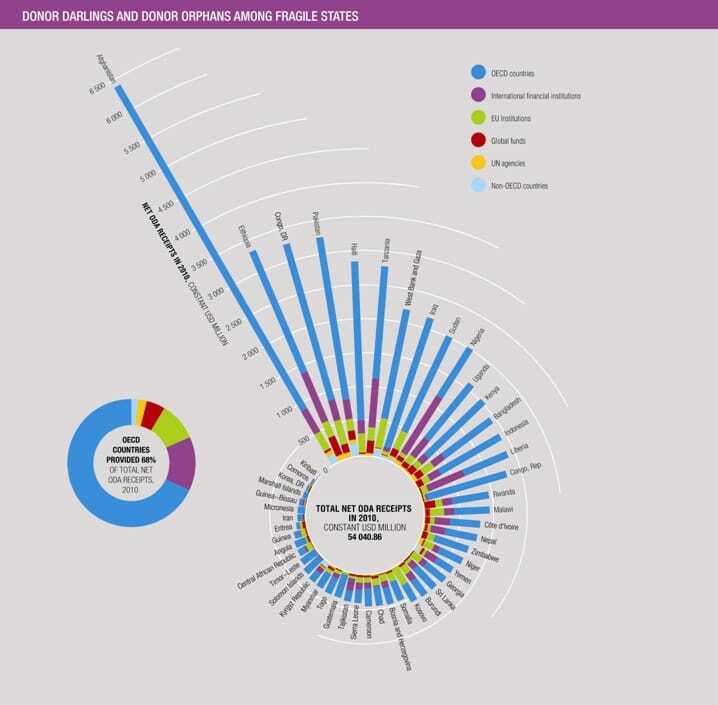 One of a striking series of graphics from the OECD (the Organisation for Economic Co-operation and Development which is made up of most of the richest countries in the world) shows where overseas development assistance is going. “Donor darlings”, as the OECD caption calls the biggest recipients, get a surprisingly large amount of the US$54 billion spent throughout the world. Depending on your philosophical position, you will either think it is right that the countries in the worst trouble (Afghanistan, Pakistan and the Palestinian Territories, for example) get the most money or you will see it as a symptom of how dysfunctional the international aid system is that so much money goes to places with such a poor track record of using it well. Other donor darlings include Ethiopia (whose political system is often seen as repressive), the Democratic Republic of the Congo and Tanzania (which has been a darling for a long time but made slow progress in economic development). This is the view from the OECD but next time anyone tells you about growing ODA from the BRICS, ask them which piece of this chart they disagree with. It shows almost no aid coming directly from the emerging economies to the poorest states. This is partly a question of how the OECD defines aid but it is mostly that there is more spin than charity flowing from the BRICS to the poorest countries.